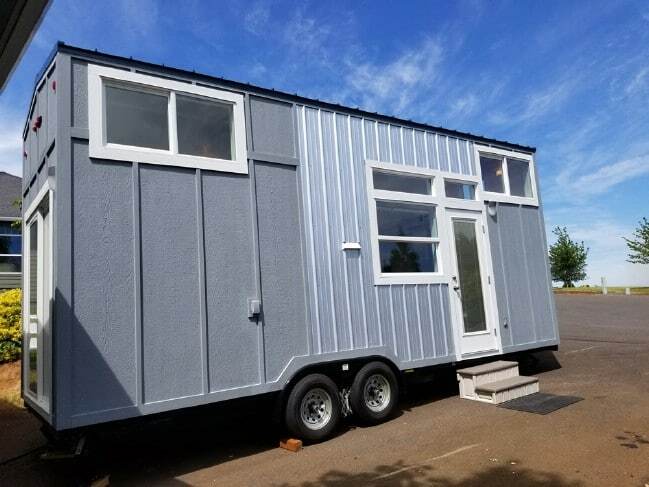 Searching high and low for the company to build your tiny home? There are a lot of great choices out there, but one you might want to look into is Tiny Pacific Houses. This builder has designed a lot of stunning tiny houses which are surprisingly spacious inside, one of which is the 24’ Olokai. The house looks simple on the outside, but the interior boasts a few surprises. Wide glass doors ensure that plenty of light pours into the interior, while also offering lovely views outside. A monochromatic color scheme keeps the look of the interior fresh, open, and clean. Features that stand out in the kitchen include the large fridge and freezer, the oven and cooktop beside it, and the huge sink basin. 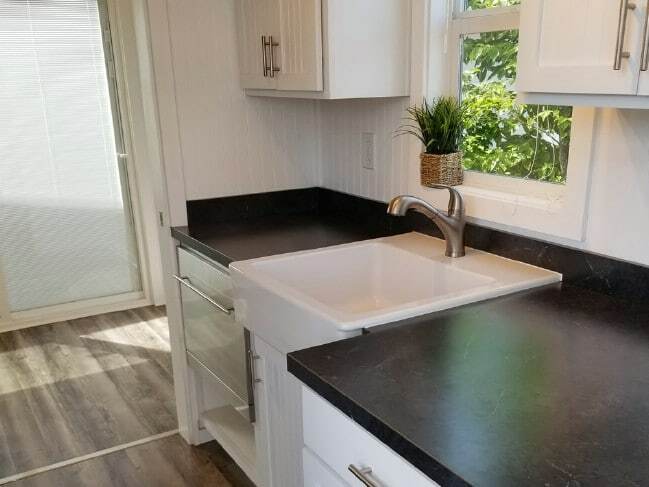 Seriously, that sink looks bigger than a lot of sinks in full-size homes! The bathroom continues the monochromatic color scheme. 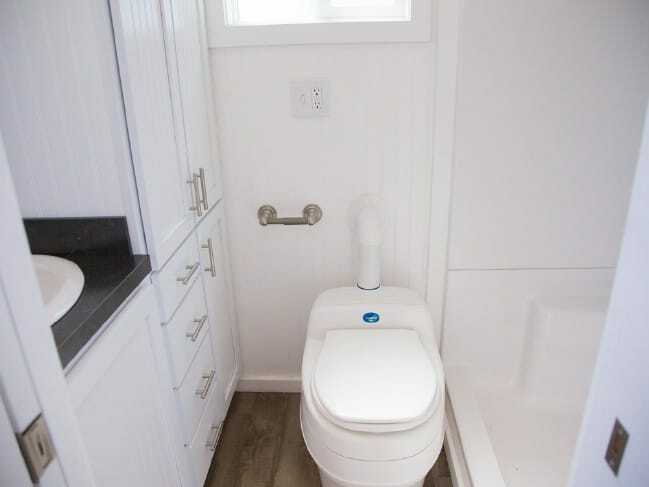 The cabinets, like the walls and the toilet, are white. Only the hardwood floor and the countertop provide splotches of contrast. 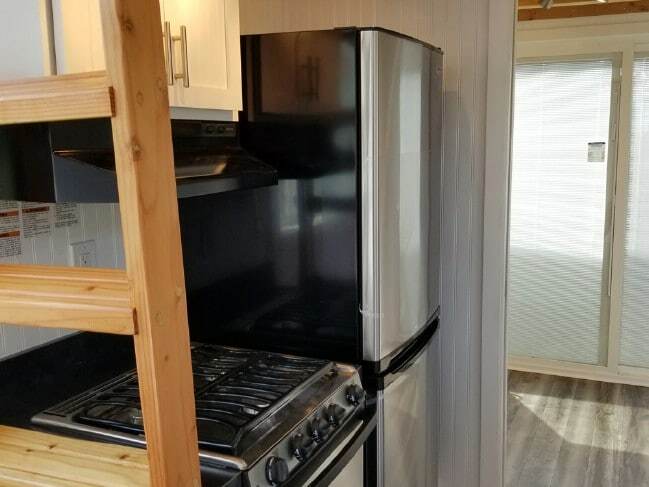 I’m really impressed by the amount of cabinet space in here! 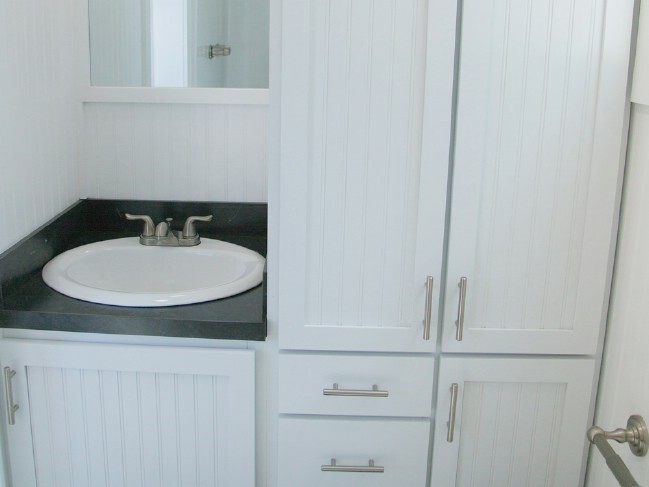 Your average tiny house has very little storage space in the bathroom—usually just whatever space is under the sink or behind the mirror. I imagine that if I lived in this house, I would be using those cabinets for more than just bathroom supplies. They’d be perfect for overflow from other rooms in the home. This last photo is arguably the one that impresses the most. 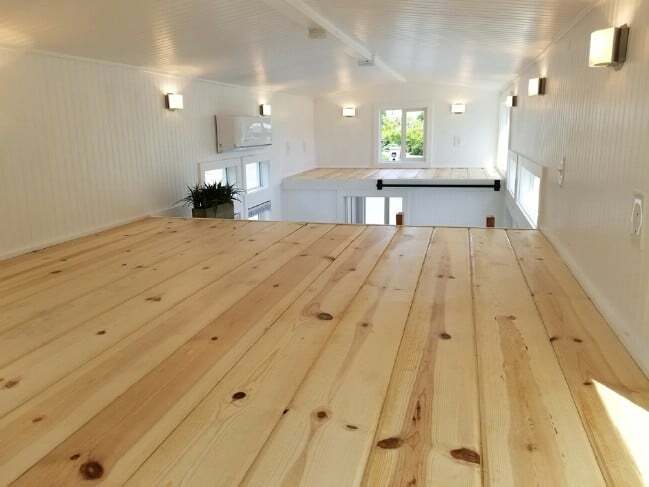 Here you can see the two spacious lofts in the home, clearly getting a feel for the floor space offered by each as well as the ceiling clearance, which is substantial. The larger of the two lofts is able to fit a king size bed. The other looks like it could fit at least a twin size bed if needed. While I enjoy the open feeling the lofts have now, some railings would probably be a good safety feature. 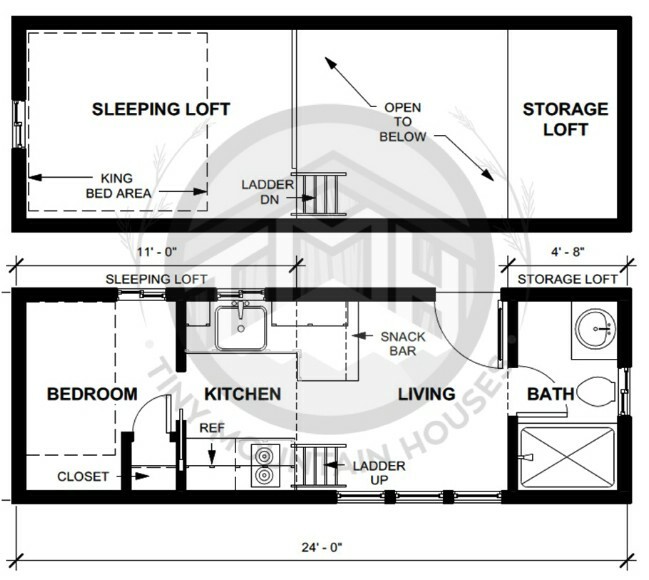 Looking at the floor plan, it seems that the downstairs area actually includes a bedroom as well. This is remarkable considering that most tiny houses do not find room for a traditional bedroom. It is too bad that there is not a picture available. You can get a glimpse of it in the video below however—it appears to be the room with the glass doors. Enjoyed checking out the Olokai, and want to learn more? 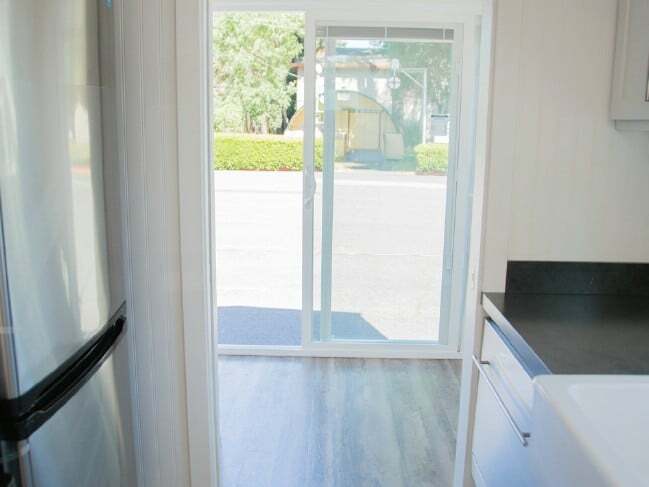 You can find out all about this lovely home over at Tiny Pacific Houses. 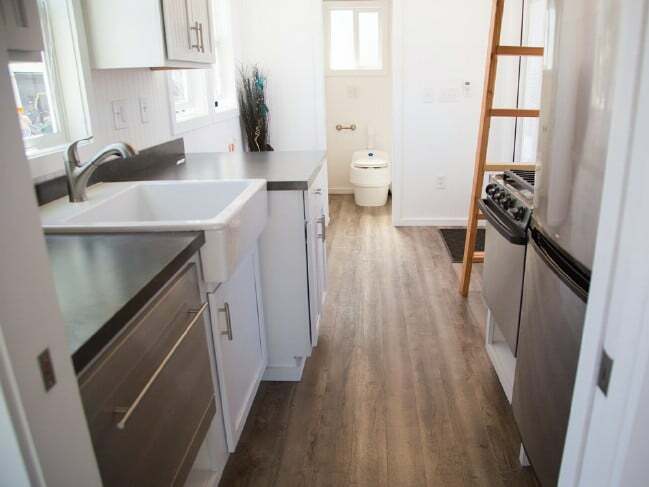 On the site, you also can browse through the rest of the tiny home layouts offered by this designer, and you can contact the company to commission a home of your own. How do i get this house?